In 2005, riots spread from Paris following the deaths of Zyed Benna and Bouna Traoré while fleeing the police. They spread as popular culture, finding a mass audience who could identify with their song—an audience unusually vulnerable to the constant violence of state and market. The following year, student-led CPE riots over attempts to restructure youth-labor markets roiled the French capital. In Oakland, riots opened 2009 after police murdered black youth Oscar Grant; in the next year, a series of university occupations against austerity would roll across the Bay Area, California, the nation. The pairing returned in the UK, order reversed: 2010 student struggles featuring university occupations and the sacking of Tory headquarters, then the 2011 Tottenham riots after the police fatally shot Mark Duggan. One form of riot seems structured by race, the other by the university; one by the character of the ongoing exclusion and the violence that guarantees it, the other by an exclusion just coming into view in the very place that promises its opposite. These events seem like a new but persistent feature of the social landscape: a double riot that needs to be grasped as a unified event. That work is already being done, not in theory but in practice. 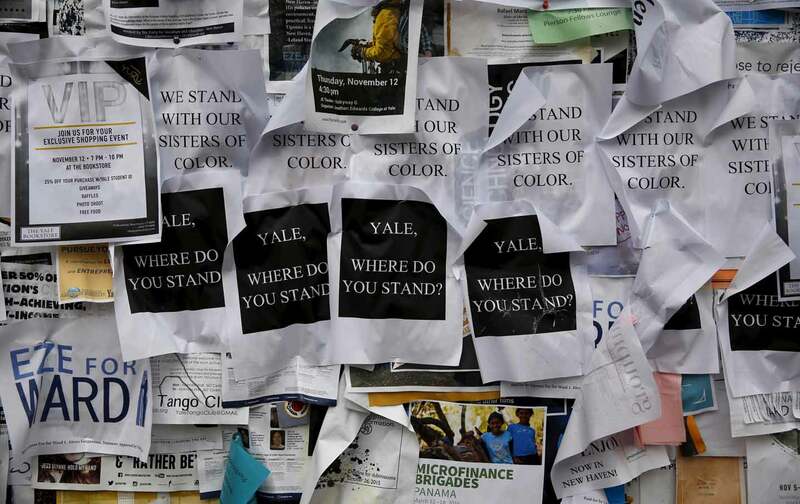 The events on campus this fall have cascaded from Missouri to Yale, and then across the country. Each incident has its own particulars, but the repetition testifies that this is something structural—something beyond a callous president here, some supposedly coddled students there. The political trajectory was launched by the murders of Trayvon Martin and Michael Brown and the riots that followed, increasingly branded as #BlackLivesMatter. The movement has landed on over 20 quads, with more to come—the anger over ceaseless racial threat entwining with the recognition of campus as one more zone of unfreedom. The contemporary university is increasingly a financial concern with some classrooms attached. Its austerity programs are enacted unevenly on different populations, requiring ever more aggressive enforcement, both physical and ideological. This has included defending something like the right to racism itself, under the aegis of “free speech.” The response has been a distributed and ongoing event we might call the campus race riot, the double riot simplified into one. This outcome of complex and long-­developing events has been zealously misnamed the “free-speech wars.” It is nothing of the sort. It’s a struggle against a long-standing commitment to racial violence—a struggle in which shouting “Free speech!” is a move that one side likes. That side likes to pretend it is not a side, that it simply wants to maintain abstract principles assuring the fairness of all future fights. That side has cops. It also has useful allies in the form of liberal “concern trolls.” I just want to help you, says the troll, and I am very worried that if you continue with your shortsighted ways and do not comply with the precepts of the social order, you will never be able to change the social order. The concern troll’s argument, more concretely, is that students or whoever will need those free-speech rights later for some more significant fight. They say further that everybody loves free speech in principle; if you forsake it, you forsake popular support. There are several holes in this argument. It ignores the historically volatile category of what counts as protected speech, rather than seeing these recent struggles as direct challenges to the current definition (after Citizens United, we might suggest that the current legalisms around speech are not worth preserving). It ignores that “winning people over” isn’t always the expedient political course but often a means of pacification, a demand for respectability politics above all. It ignores that people stand in historically unequal relation to speech itself. The reason it’s not hateful to dress up for Halloween as a white dude, with a stupid haircut and mayonnaise dripping from your maw and a T-shirt emblazoned with my parents went to yale and all i got was this lousy trust fund, has nothing to do with the speech embodied in those costuming choices. It has to do with the absence of a centuries-long history of hunting, enslaving, and killing white people. But let us accept the speechbro’s basic proposition: that there will be a more significant fight later than the debate over Halloween costumes or cultural appropriation, and that one should keep a strategic eye on that moment. This is surely true. When the fight actually comes to get cops off campus, to abolish the administration, destroy all student-loan records (soon, please! ), do we really believe these battles will be won with “civility” and lip-service liberalism when the current, lesser fights cannot? Contrarily, we can be assured that these fights will be even more rigged for “speech” to be ineffective, diversionary, and neutralizing. If it were obvious that free speech in principle was a limit to emancipation in reality—a formal equality corresponding to real exclusions—would we still treat it as gospel, unchallengeable? Or would we eventually recognize that it is just one means, though an important one, in a struggle whose ends are elsewhere—that beyond civility there’s a riot going on, one that’s not a mistake but a truth?